1) Johnny Butkovich / 17 / ? / ? 2) Darrell Sampson / ? / April ?,1976 / ? 3) Randall Reffett / 15 / May 14,1976 / ? 4) Samuel Stapleton / 14 / May ?,1976 / ? 5) Michael Bonnin / 17 / June ?,1976 / ? 6) William Carroll,Jr. / 16 / June 13,1976 / ? 7) Gregory Godzik / 17 / December 12,1976 / ? 8) John Syzc / 19 / January 20,1977 / ? 9) Robert Gilroy / 18 / September 15,1977 / ? 11) Frank Wayne Landingin / ? / ? / ? 13) Timothy O'Rourke / ? / ? / ? 14) Richard Johnston / 18 / ? / ? 15) Robert Winch / 16 / ? / ? 16) Matthew Ronan / 19 / ? / ? 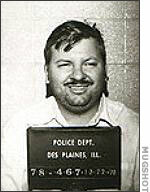 Full Name: John Wayne Gacy,Jr. After Piest's disappearence,officers learned that Piest had stepped outside to speak to a contractor named John Gacy,minutes before he went missing.Investigators visited Gacy at his home,asking him to come down to the station for questioning,but Gacy gave an excuse and could not leave his home at that moment.Hours later,Gacy showed up at the Station and gave a statement that he knew nothing of Piest,or his disappearence,and left.A background check was ran on Gacy,and it was found out that Gacy had been in prison years before for sodomizing a teenaged boy,this opted officers to get a search warrant for Gacy's home.On December 13,1978-officers searched Gacy's home while he was not there.Over 21 items were confiscated,including three cars,one of which hair was found in the trunk-(which,not known at this time,was Piest's).Gacy was called to the Station,he was enraged about the items that were confiscated,so he called his lawyer,whom than made officers realize that they did not have enough evidence to hold Gacy,and so,Gacy was let go,but put under 24 hour surveillance.Officers then decided to arrest Gacy for possession of two drugs that were confiscated(valium and marijuana).While Gacy was under arrest,all the confiscated items went through lab testing-a class ring that was found belonged to Syzc,and a reciept for a roll of film that was also found at Gacy's home was given to Piest the day he disappeared,by a friend.Investigators went back to Gacy's house,and at this time,Gacy confessed to the murder of only one person,and under pretenses of self-defense.Investigators decided to search all the grounds around the home and this led to a crawl space under the house;there they looked and underneath a strange mound of dirt they found the remains of a body.A medical examiner was brought in to supervise as officers began to undig the earth under Gacy's home,Gacy then on December 22,1978,confessed to more then 30 murders,where not only did he keep the bodies under his house,but when he ran out of space,he threw them into the Illinoise River.By April 1979,all bodies had been recovered. On February 6,1980-Gacy went to trial where he pleaded not guilty by reason of insanity.Among witnesses called at the trial were family and friends of the deceased,past co-workers of Gacy's,whom stated that they had violent encounters with Gacy,and a surviving victim(Jeffrey Rengall).In all,60 witnesses were called.It only took the jury two hours to come back with a verdict of guilty and that Gacy was sane at the time of the murders.He was sentenced to death on March 13,1980.On February 15,1983-while Gacy was serving his time on Death Row at Menard Correctional Center,he was attacked by a fellow prisoner(Henry Brisbon),stabbing Gacy in the arm with a sharpened wire.In 1992-Gacy's home was demolished.Then,on May 10,1994 at Stateville Correctional Center,just a little past midnight-Gacy was executed by lethal injection.Before Gacy's death,however,the family of Piest filed a lawsuit for $85 million against Gacy,as well as the Iowa Parole Board-the Department of Corrections,and the Chicago Police Department,for allowing Gacy out of jail back in 1968.Till this day,nine out of the 30+ bodies found at Gacy's home have not been identified.